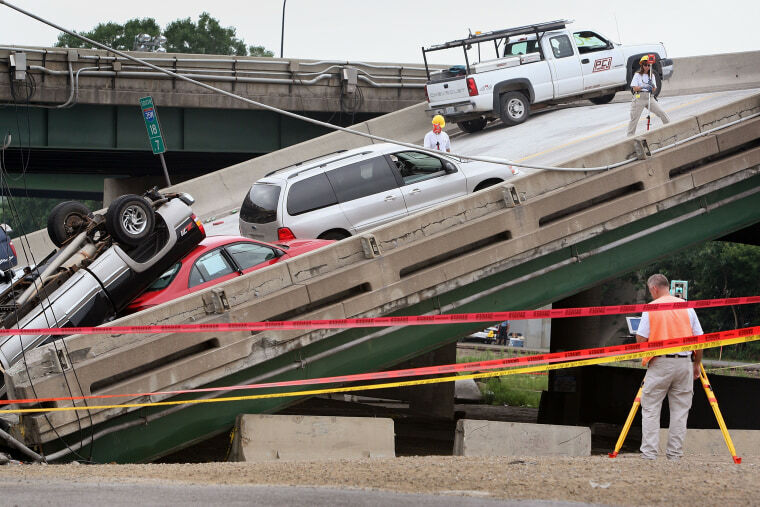 Political leaders certainly talk about the nation's crumbling infrastructure. But now a team of scientists have hit upon what may be a simple, low-cost fix for the problem. They've found a way to make self-healing concrete and they say it could prove useful for shoring up existing roads, bridges, and tunnels as well as for building new ones. "It is suitable for any concrete infrastructure," Dr. Congrui Jin, an assistant professor of mechanical engineering at Binghamton University and leader of the team, told NBC News MACH in an email. The key to the remarkable material is Tricoderma reesei, a fungus first isolated in the Solomon Islands during World War II when it was found in rotting U.S. Army equipment. When fungal spores and nutrients are mixed into concrete used to build a new structure, they initially lie dormant. But when cracks appear and let in water and oxygen, the spores germinate and grow — and form deposits of calcium carbonate. Once these mineral deposits harden, the scientists say, they fill in the cracks before water has a chance to corrode steel reinforcements and cause structural failure. "When the cracks are completely caulked and no more water can enter, the fungi will again form spores," Jin said. "If cracks form again and environmental conditions become favorable, the spores could wake up and repeat the process." To repair existing structures, the spores would be put into a liquid that is then sprayed into cracks. The research is at an early stage. More studies are needed to determine how the T. reesei spores affect concrete's strength and permeability, as well as how long the spores can survive within concrete. But especially given the cost of inspecting concrete structures on a regular basis, as well as the challenges associated with fixing bridges and other structures that are in continuous service, Jin said self-healing concrete could be a good solution to a vexing problem. "We are confident that this will really work as a low-cost, pollution-free, and sustainable approach," she said. What do other infrastructure experts make of the new research? Kristina Swallow, president of the American Society of Civil Engineers, sounded cautiously optimistic in an email to MACH. "It's hard to quantify how impactful this could be," she said, adding that self-healing concrete was now a hot research topic. "However, one promising aspect of this new solution is that it can fill the smallest of cracks, therefore preventing it from growing — and with it, the cost to fix it." Whether self-repairing concrete pans out as Jin and her collaborators at Binghamton and Rutgers University expect it to, there's little doubt that our nation's infrastructure is in a sorry state. In the society's 2017 "Infrastructure Report Card," U.S. infrastructure earned an overall grade of D-plus. "Over the next 10 years," Swallow said, "the U.S. needs to increase our investment in infrastructure by $2 trillion across all levels of government and the private sector." A paper describing the research was published in the March 10, 2018 issue of the journal Construction and Building Materials.